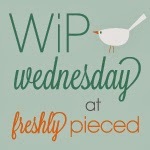 I don't know when the last time was that I posted a Work in Progress Wednesday post, but blogging has become less of a priority since Instagram became popular. I know a lot of my friends have the same feelings about it as I do. Comments are down on blog posts but Instagram likes are up, so I guess we are all more of the instant gratification generation, no matter how old we are. Here's what I have been working on. It seems the projects I have chosen lately are more of the long term projects than quick, except for one, this quick quilt top. I put out a request on Instagram the other day for suggestions for an easy and fast to sew laptop sized quilt. @Kelbysews suggested this layer cake pattern and it definitely was easy and fast. I had the squares sewn together in a few hours and pieced the top together the next afternoon. The fabric was from a kit I bought when I first started quilting a few years ago. It's not really my style anymore, but the recipient of this quilt will really like it. Once it is quilted I am hoping I will like it better too. A project I started at the beginning of the year is my DS Clamshell quilt. This one is a humongous beast but oh so pretty. With 21 of the 27 rows of clamshells already sewn the end is near. I love sewing this quilt and I think there are more clamshell quilts in my future. It will be king sized when it is completed. I wanted to try downsizing a block from the Vintage Quilt Revival book and it was definitely a success. You wouldn't imagine by looking at this 6" block, but it took me 4 hours to complete. Between figuring out the math and many sewing and ripping out and re-sewing of seams, it turned out just as I imagined it. Although I don't think I will be making many more of this size. I do love the color palette. Don't you? I love this block but will stick with the larger size as explained in the book. And finally, I might have one sock syndrome. 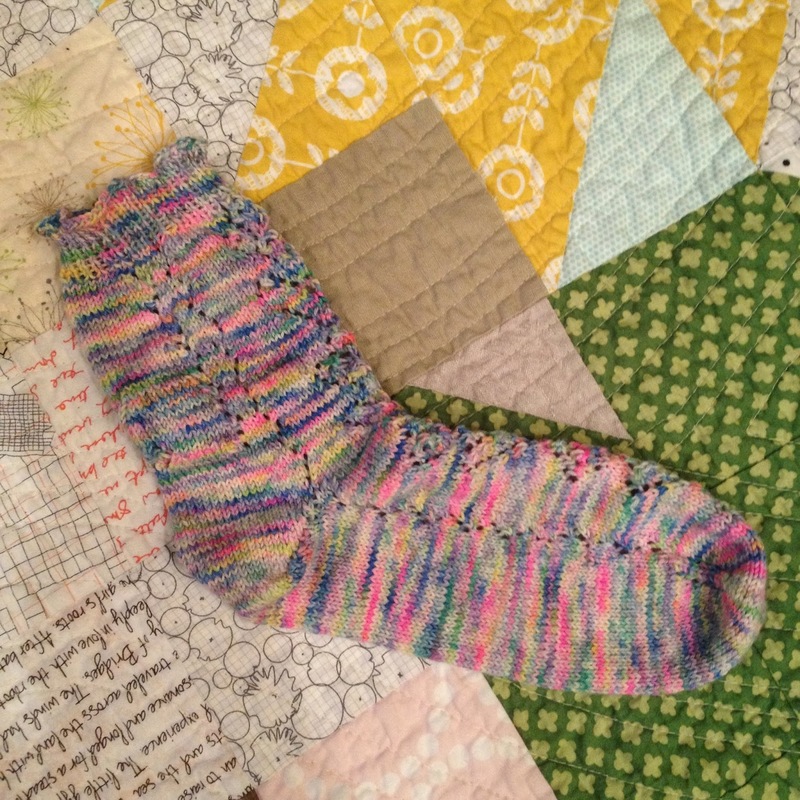 I completed this sock after working on it a very long time. I've learned a lot with this sock. I don't like making lace pattern socks, where every row is different and I rather prefer the two socks at a time method, because when you're done...you're done! I will make the other sock because I decided these are for my mom, but the next pair will be two at a time, for sure. Linking up with Lee for the first time in many months. I have a few other projects in various stages of completion. Some are secret, some are gifts and some will be revealed in a future blog hop series. So please come back and check this space in a few days. Wow, that clamshell quilt looks amazing! That's going to be a gorgeous quilt. clamshell is on my to do list for forever now, love yours. I'm just discovering my way around instagram but do find blogland a bit quieter with fewer posts and comments as well. Holy moly I love that clamshell quilt! I'm not on Instagram, and have no plans to join so it's nice to see what you're up to again! I love the clamshell quilt. It's going to be AMAZING! I'm not big on instagram. I think it is very impersonal. I love the clamshell! And hey... if you have mismatched socks you are on trend! My daughter BUYS hers that way! I find making two socks at a time makes the needles and project heavy and cumbersome so good for you if you love working that way. I used to knit one sock from one pair, then one from the next, then back to the first pair's second sock to keep it more interesting. I love your quilts, especially the clam shells. Instagram is fun but I never go back to the days before and I can only look at it a few times in any given week so I miss most of what happens there. I do try to read all the blog posts even if I cannot comment on them all. If there is any comfort in numbers, since I began the vintage block-along, I have ripped more on the 14 blocks I have made than sewn on them. It has been rough. AND...I am a one sock knitter. 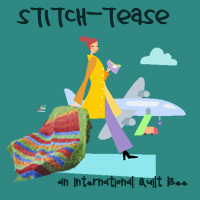 I read an article by a knitter years ago who only knitted one sock by one pattern and the other by another. I loved the idea and have follower that mantra ever since. My students used to love my mismatched socks. 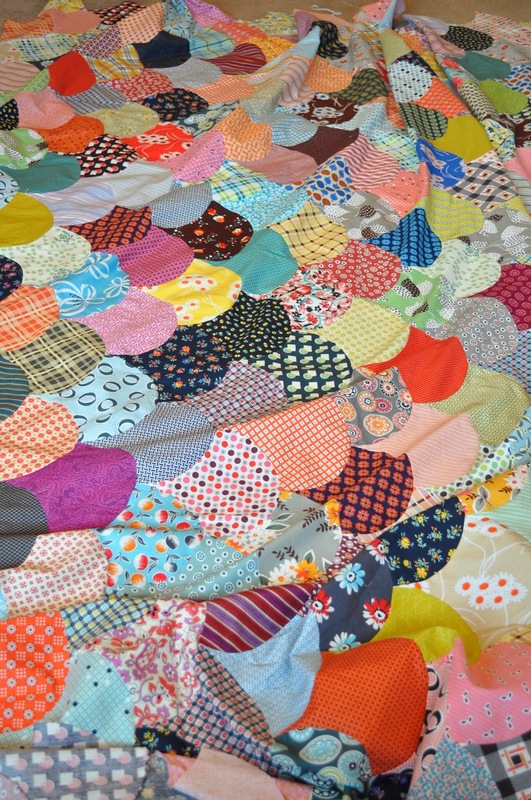 Your clamshell quilt is one awesome and colorful piece of work. I love your 6" block, your colour choices are just beautiful - I don't suppose you'd share the measurements with me please. Also please don't stop blogging - I don't have Instagram, or a fancy device to get it. I love seeing what you make, your travels and family. What is the name of the block for the layer cake quilt you are making? Can Denyse Come Out and Play?